I am on vacation in northern climes with my family and am staying with a family friend who heats his house almost exclusively with wood (has a heat lamp in the bathroom and a few base board heaters that are rarely used). He keeps three seasons of wood put up at any one time and I helped him do some splitting. He has been doing this for decades, but he handed me the book I am reviewing and said "I thought I knew something about wood until I read this book." 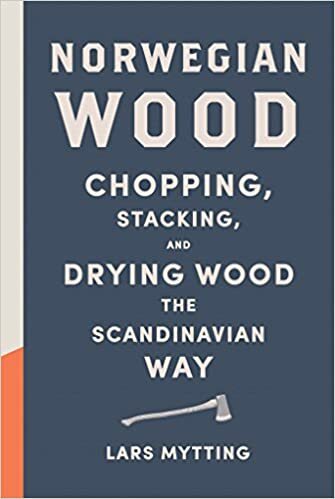 Lars Mytting's Norwegian Wood is a short, information filled book on how Scandinavians deal with their harsh and relentless winters, with wood heat. Interestingly wood heat is now more widely used in Scandinavia now than it was in 1970s (pre-energy crisis). Additionally it is seen (and he makes a very convincing case) as ecologically sound by Scandinavians. It is also a requirement in many cases with Norway requiring all inhabited buildings over a certain number of square feet to have a redundant heating system in order to keep winter storms and power outages inconvenient rather than civil emergencies. This effectively means that a very large percentages of buildings in Norway have a wood stove of some sort. He goes into how trees are selected, cut, gathered and cut up for firewood. He also goes into how they are split, stacked, dried, placed into woodpiles and sheds for storage. He goes through stoves that are used for hearing including new innovations for more efficient burning (yes they produce less pollution, but also produce more heat) and how best practices can make older stoves produce more heat and less pollution. There is much more to the science of when, how and what to cut, dry and split than I realized. Interestingly, the author is also a writer and can actually write well. He makes a topic that could be boring or pedantic, interesting. He also explains the aesthetic and psychologically pleasing aspects of the process of procuring and using wood without getting wishy washy. He walks the line between information and entertainment and artistic talk deftly. Its entertaining, a fast read and very informative. I would recommend it simply because its entertaining, even if you live in Alabama and don't need wood heat. Different types of chainsaws, axes, splitting mauls and other tools are discussed with an obvious focus of those produced in or popular in Norway, Denmark, Finland and Sweden obviously. Stoves both old and new. Some human stories of people and their relationship with wood heat and procuring it. One thing I found interesting was how cutting, preparing and burning wood encourages long term thinking in people (something we think of in the homesteading world). The short term thinking of building woodpiles in the springtime over a few weeks, mid-term of having a season of wood and watching it get consumed over the winter as pile after pile disappears into the stove, long term thinking as people plant and cultivate stands of trees, encouraging them to grow fast and straight and know that their children will be middle aged before they harvest and turn it into fuel. It is an approach to life that probably can find other examples of outside of wood burning, I found it inspirational.